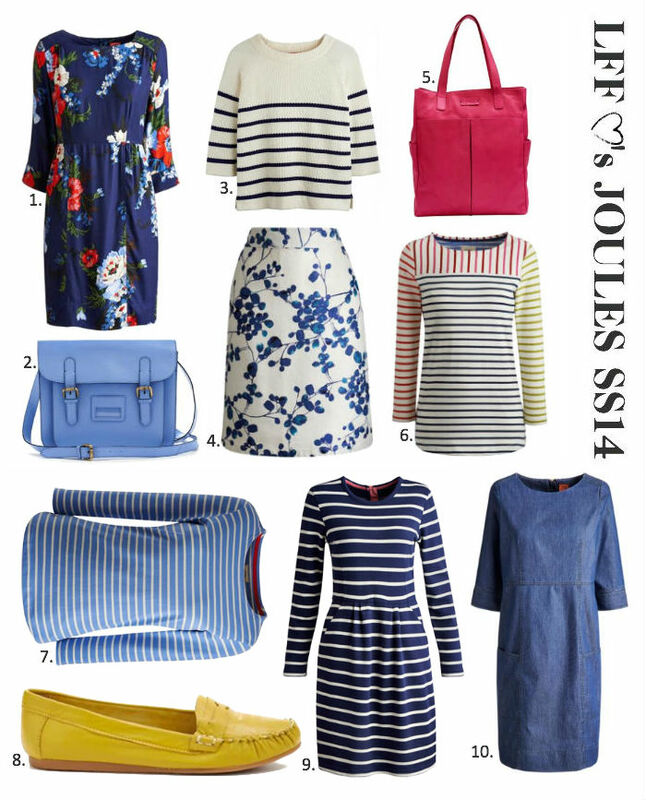 Joules' SS14 collection is full of dreamy, colourful, wearable pieces that will fast track your wardrobe into spring. Top of my wishlist is the gorgeous kaleidoscopic Hotch Potch stripe tee (no.6), updating the classic Breton with a hit of colour. Tunic dresses are one of those easy throw on pieces that look insouciant and cool, the pretty floral tunic (no.1) is a sartorial no-brainer and also comes in chambray, just add tan sandals and you're ready for summer. Vibrant leathers are also a big hit in the collection, the hot pink Richmond leather tote (no.5) is a smart but softly structured style, perfect for the 9-5 in summer. What do you think of the collection? 1. Lula floral tunic, £69.95. 2. Light blue satchel, £99.95. 3. Merrin knitted stripe jumper, £69.95. 4. Chrissie floral skirt, £49.95. 5. Richmond hot pink leather tote, £169. 6. Hotch potch stripe tee, £24.95. 7. Powder blue stripe tee, £24.95. 8. Elna women's yellow loafers, £64.95. 9. Thurwell stripe dress, £49.95. 10. Aberly chambray dress, £69.95. LOve this pink bag !!!! i love no. 2 so much! Love that stripped dress so much!